It is becoming a common statement this electoral period for people to state that they will not vote for the lesser of the two evils, since evil in any form is evil. Strange statement to make because as many of us know, we are presented daily with choices that don’t necessarily fall into the neat category’s of ‘good’ and ‘evil’. What do we do when we are presented with choices that either will leave a bitter taste in our mouth? We generally go with the less bitter. That is what may be needed for the fence sitters to consider. 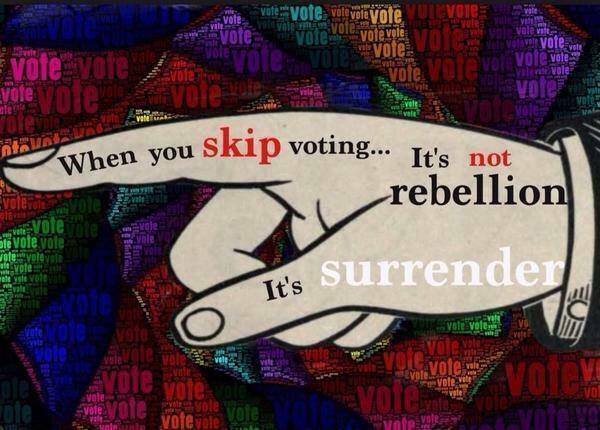 Not voting is simply wrong. If both choices are evil, then to not vote says you except either, evil as they may be to you. We know that one choice will keep us on the same financial, moral, ethical track we are on. The other choice we ‘think’ we know how it will turn out, but who’s to say it might not be better? For those that have no moral backbone, the choice is clear. For those that at least think they have a moral backbone, then choose!! Don’t dilly-dally about this election. You don’t want to meet me and tell me you didn’t vote and then start complaining about the policies being put on us. I will tell you to please be silent since you had no voice in the results of the election, then I will walk away and ignore you. This image is from ‘Wake UP, America’ on Facebook and fits this article well.